Rockford, Ill. (November 22, 2016) – Rockford Spine Center Surgeons Michael Roh, M.D., and Fred Sweet, M.D., recently attended the Scoliosis Research Society (SRS) Annual Meeting & Course in Prague, Czech Republic. Dr. Michael Roh participated in a panel discussion about the state of healthcare in Rockford at the 2014 Rockford Chamber Healthcare Luncheon. If you missed the event, you can watch the video at the below link. 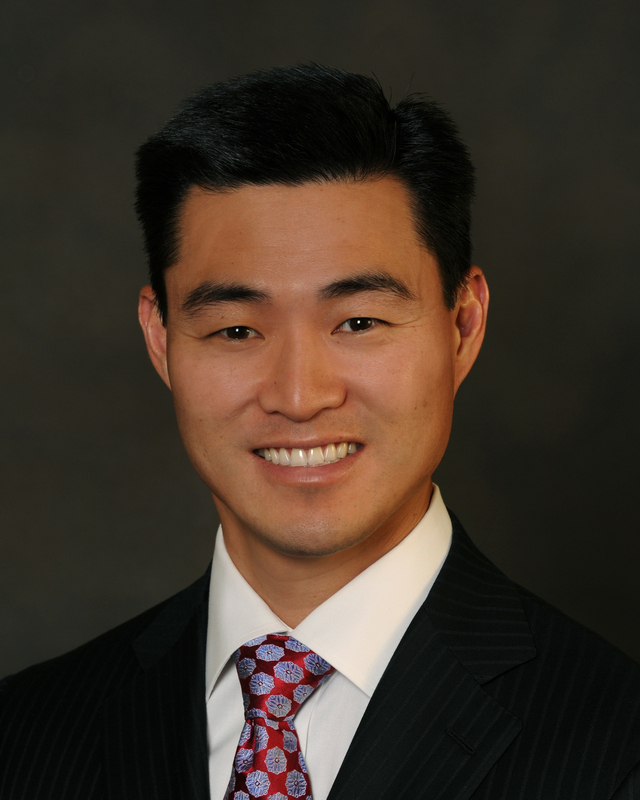 Dr. Michael Roh was a featured panelist at the Rockford Chamber of Commerce Healthcare Industry Update luncheon on November 20, 2014. The event focused on the important role specialty group practitioners play in the local healthcare landscape. Dr. Roh engaged in dialogue about trends and impacts in healthcare as well as discussed the local healthcare industry and its relationship to the broader business community. Dr. Roh highlighted the level of care available to patients in Rockford - across the healthcare spectrum. Rockford Memorial Hospital thanked Dr. Fred Sweet and the team at Rockford Spine Center for its partnership in offering award-winning spine surgeries at the hospital. RMH has been recognized by Healthgrades as one of America’s 100 Best Hospitals for Spine Surgery. Healthgrades evaluated nearly 4,500 hospitals nationwide. RMH also received the Healthgrades Spine Surgery Excellence Award for the third year in a row. That award is given to hospitals that rank among the top 10 percent in the nation for spine surgery. For nine years in a row, RMH has received a five-star rating for spinal fusion surgery. Rockford Spine Center performs many of its surgeries each year at RMH and is proud of its partnership with the hospital and its surgical teams. 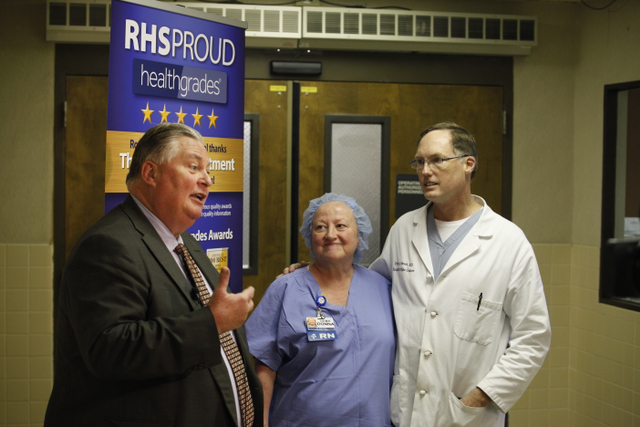 Dr. Fred Sweet (far right) is pictured with Rockford Health System CEO Gary Kaatz (on the left) and Donna McDaniel who oversees the operating room department at RMH. Neck or back pain, sciatica, or pinched nerves can take over your life. Often times resulting in a feeling of hopelessness. Want to learn more about what treatments work without the hassle of making a doctor’s appointment? Dr. Fred Sweet is hosting a free community spine care seminar at Rockford Spine Center. This event is free and all are welcome. Dr. Sweet will discuss common spinal problems, treatment options and answer your questions. Refreshments will be served. Please RSVP to Hollie at 815-316-6873. Our beloved patient Mark, who has been diagnosed with ALS, challenged Dr. Marie Walker and Cindy Nyquist to the ALS ice bucket challenge. They happily accepted the challenge - and the sequence of ice water dumping began. Check out the below videos featuring Dr. Fred Sweet and several members of the RSC team. We think this is a great cause and promotes awareness for a devastating disease! FREE Community Healthcare Talk in Beloit, WI, with Dr. Fred Sweet on Saturday, October 26, 9 to 11 a.m. Many people suffer from neck and back pain for years without any permanent relief. The physicians at Rockford Spine Center specialize in treating several common spinal disorders. Join Fred Sweet, MD for a free community health care talk to learn more about your symptoms. Dr. Michael Roh will take part in the Rockford Chamber of Commerce People You Should Know talk series. He will discuss common myths about back surgery on Wednesday, February 13 from 12 to 1 p.m. at Rockford College. Dr. Roh was named one of the 21 People You Should Know in 2011. Click here to learn more about the event and how you can register. Join Dr. Fred Sweet at a free community health care talk on common spine conditions and possible treatments. Dr. Sweet will also answer questions from those in attendance. The event will be held Saturday, February 23 from 9-11 a.m. at Rockford Spine Center, 2902 McFarland Road, 2nd Floor, Rockford, IL 61107. Please RSVP to Krystal at 815-316-6873. Join Dr. Sweet for a free community health care talk on Saturday, May 19th at the Holiday Inn Express in Janesville, WI. Dr. Sweet will discuss spinal disorders and their treatment and will answer questions from the audience. Saturday, Octobr 15th 9-11 a.m.
Join Fred Sweet, MD for a free community health care talk to learn more about your symptoms. Dr. Sweet will discuss common spinal disorders and their treatment. He will then answer questions from the audience. This is your opportunity to explore some new treatment options and gain some insight from a fellowship trained spine surgeon who specializes in advanced treatments and techniques. Refreshments will be served.